Two of the major complaints about making one’s own food are the time it takes and the cost of ingredients. Today I’m taking a break from the more canonical keto menu and venturing into no-cook seafood: quick to prepare and a reasonably-priced protein. 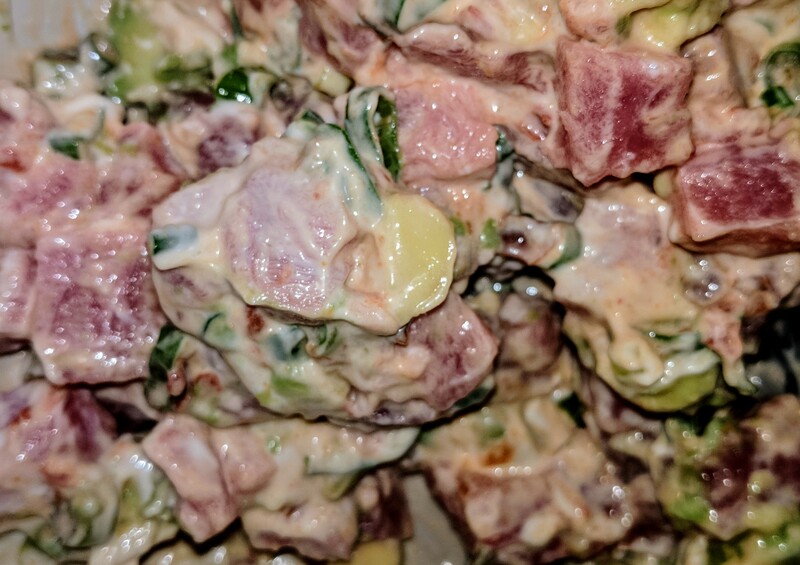 Spicy ahi tuna スパイシーなマグロ poke, a Hawaiian raw fish salad originally made from fishermen seasoning the cut-offs of their catch, is healthy, flavorful, and filling. 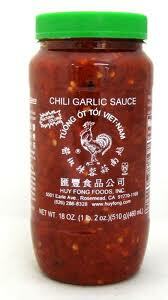 * 5 g (1 tsp) Huy Fong Chili Garlic Sauce,1 or another spicy condiment such as sriracha, harissa, Frank’s RedHot sauces, etc. * [optional] a base of riced cauliflower, Miracle Rice, etc. 1EDITORIAL NOTE: The way I first encountered spicy sauce was a mix of Japanese Kewpie mayonnaise and Huy Fong Chili Garlic Sauce. Both of these ingredients impart a special, distinctive flavor to the sauce. Using Hellman’s mayo and sriracha – for example – as substitutes makes for an acceptable sauce but lacking the tang of the original. In a reasonably large bowl mix together the mayonnaise, sesame oil, spicy sauce. Sliver the scallion, including the bulb; add. Cube the avocado and the fish into the mix. Gently combine.